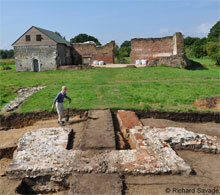 Friends of Woking Palace win Heritage Lottery Fund support! The Friends of Woking Palace are thrilled to have received initial support from the Heritage Lottery Fund (HLF) for their bid to carry out the "Woking Palace & its Park" project and to have been awarded development funding of £12,300 to help them progress their plans to apply for a full grant of £193,500 later this year. Henry VIII developed Woking Palace, which became a much favoured hunting retreat for himself and other monarchs, from his grandmother’s extensive manorial residence surrounded by a large Deer Park that dates from as early as the 13th century. Woking Palace is a Scheduled Monument and Simon Thurley, Chief Executive of English Heritage, has described Woking Palace and Deer Park as "a major post-medieval archaeological site with one of the most important late fifteenth century buildings in England". 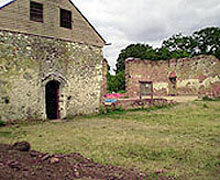 The project aims to better understand and tell the story of the development of Woking Palace and its surrounding 590 acre Deer Park from its earliest days right through its glorious Tudor period to modern times when it had fallen into ruin and was rescued for posterity by the purchase of the site of the moated ruins by Woking Borough Council. Today the Friends assist Woking Borough Council in various ways including holding Open Days on three weekends a year. 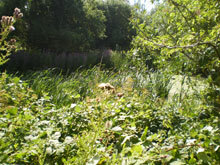 "Woking Palace & its Park" aims to engage the residents of this part of Surrey with their heritage through a three year community education and outreach programme studying the moated site and its surrounding area that will include the chance to participate in 'digs' on the site and also in workshops and courses designed to extend archaeological and related skills. 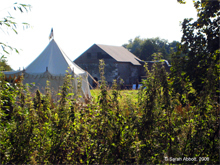 These will cover topics such as the processing of the finds recovered, surveying the site and the ancient parkland that surrounds it, documentary research and the writing of reports to share new knowledge gained. A particular focus of the project is to take hands-on history into local schools and clubs to encourage young people to appreciate the rich heritage on their doorstep. In addition, it is planned that the new discoveries will be shared through interpretation boards on site, travelling displays, talks, guided tours, the web, information packs, worksheets, hand-outs and other material. Delivery of the "Woking Palace & its Park" project will be carried out in association with Surrey County Archaeological Unit, Surrey Archaeological Society and The Lightbox amongst others. Sarah Abbott, Chairwoman of the Friends said “We are delighted to have received this support from the Heritage Lottery Fund to allow us to uncover and share the fascinating story of the hidden rural gem that is Woking Palace and its Park and to walk in the footsteps of the great, the good and the lowly of history." Stuart McLeod, Head of the Heritage Lottery Fund for the South East, said: "We’re extremely pleased to give initial support for this project which aims to bring alive the story of Woking Palace. We look forward to receiving the application for a full grant in the future." We won the full grant!! See details.